You had me at your entrance gate. We pulled up to the entrance of Banff National Park on the Trans-Canada Highway and were surrounded hundreds of other cars. No stranger to long national park entrance lines (I’m looking at you, Yosemite) we grabbed the beef jerky from the snack bag and settled in for an anticipated long, long wait. But, the line started moving - and quickly. We rounded a corner to see more entrance booths than the busiest tollway and cars swiftly being ushered into the park. Just a few pieces of jerky later, we were headed into one of the most beautiful natural areas in North America. Thank you Banff! Entering Banff from the Calgary side of the park. Banff, Canada’s first national park, is a short hour and a half drive from Calgary and consists of more than 4,000 miles of mountains, glaciers, meadows, rivers and lakes. July and August are the busiest times of year in Banff and it was apparent we wouldn’t find much solitude. The gorgeous scenery brings visitors from all over the world and I loved sharing the park’s trails with people from so many other places - even if I wasn’t 100% thrilled to be spending time on the trails with so many of them. Our hikes in Banff were on some of the most crowded trails we’ve ever been on and it didn’t matter if you went early, late or on a more challenging path. Dave and I had considered taking this trip eight years ago for our honeymoon so it was a long time coming. It lived up to all expectations and requires a few more visits to explore all there is to do in this incredibly breathtaking area. We hit the well-known highlights (which no doubt contributed to the crowds) in our three short days. I’ll let the pictures do the rest of the talking. In the meantime, add Banff to your bucket list. We camped in Johnston Canyon, a 17-kilometer drive up the Bow Valley Parkway from the town of Banff. The sites are well-maintained and bathrooms were always clean. A fire permit comes with your site when you register and includes all the wood you can use! Johnston Canyon has a catwalk that allows you to hike through the canyon and above the rushing river. Johnston Canyon hike along the catwalk. This hike gets super crowded so go really early or really late in the day. 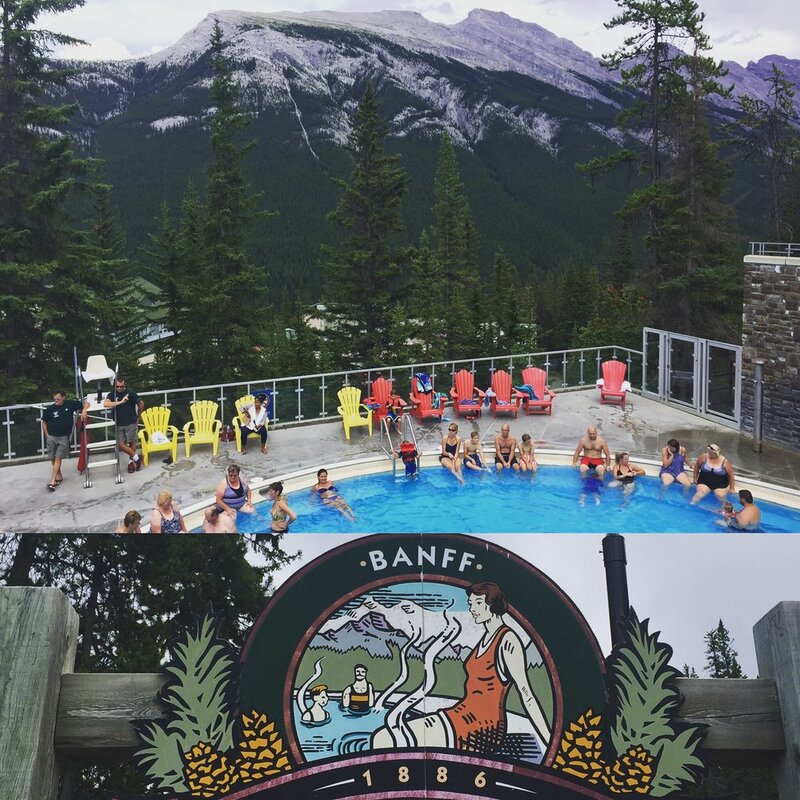 We spent the rest of our time hiking around Lake Louise, biking around the lakes surrounding the town of Banff and hitting the Banff hot springs. Canoes on Lake Louise with a glacier backdrop. Stunning! Hiking down from Lake Agnes tea house to a second tea house at the Plain of the Six Glaciers. Biking along the Vermillion Lakes just outside the town of Banff. The view from Upper Banff Hot Springs. It's run by the Parks and only $7 to enter! Best view in Banff is at the Fairmont hotel tucked back on the patio at the Waldhaus Pub. The pub overlooks the 15th tee and is the best place for a beer, schnitzel sandwich and a view! If you have the ability to bring bikes with you - do it! 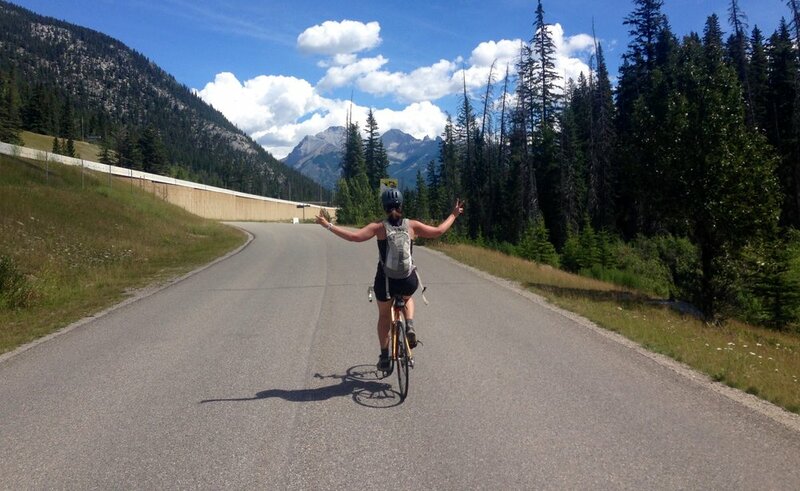 The traffic in the town of Banff is insane and it's much easier to park a little outside of town and ride you bike. There is also a great bike path along the Bow River around town. Campsites and lodging book incredibly fast for the summer months. Plan far ahead for camping, especially for weekend dates. We booked our site in June for a late July trip and got the last campsite available for three days straight mid-week - pretty sure we got lucky on that one. You can rent bear spray at Wilson Mountain Sports in Lake Louise Village for $10 a day. A much better option than buying it for $50 if you're only going to be hiking a few times.